In this experiment a fully enclosed, electrically driven gyroscope is released to fall freely under the influence of gravity. The elapsed time taken to fall a measured distance of 10.617 feet was measured, with the rotor stopped and also with the rotor spinning at approximately 15,000 RPM. 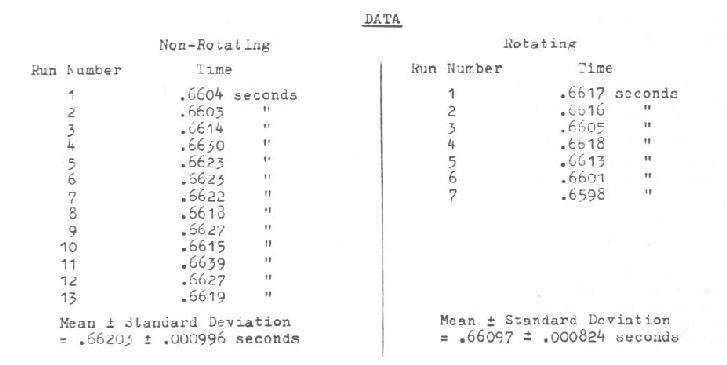 Data was gathered on a Chronometrics Digital Elapsed Dime Clock measuring 1/10,000 second, actuated by two phototransistor sensors placed in the paths of two light beams which were consecutively interrupted by the edge of the casing of the falling gyroscope. The gyroscope, of total weight 7.23 lbs (rotor weight 4.75 lbs, case weight 2.48 lbs) was released to fall along its axis. Electrical leads supplying power to the 41/4" diameter rotor were disconnected just prior to release. *Note: Value for gravitational acceleration at sea level, 390 Latitude (Washington, D.C.) based on the formula of the U. S. Coast and Geodetic Survey. The data for the non-rotating gyroscope is normalized to this value, and the data for the rotating gyroscope is compared to it. p = .0275355685 (18 degrees of freedom) On the basis of the Standard Deviations of the data from this experiment, one can say with a 97% level of confidence that a fully encased, spinning gyroscope drops faster than the identical gyroscope non-spinning, when released to fall along its axis. The following are calculations performed on the measured data to arrive at the values given in the Summary of Experimental Results (above). a = 32.1549 ft/sec (normalized value); vi = unknown, velocity v1 at time t1. a = 32.1549 ft/sec (normalized value); d = (d1 - d0 ) = unknown. a = 32.1549 ft/sec2 (normalized value); t = (t1 - t0 ) = unknown. d) Calculation to find total time taken to fall total distance for the Non-Rotating condition of the gyroscope. 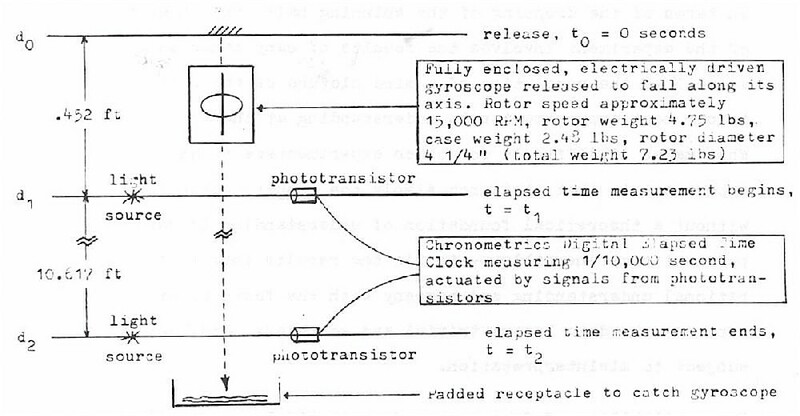 e) Calculation to find time already spent falling by the Rotating gyroscope when elapsed time measurement begins. This assumes the acceleration of the Rotating gyroscope is constant. It is found by comparing the ratio or the initial time interval to measured elapsed time interval for the Non-Rotating gyroscope, to that of the Rotating gyroscope. (t1 - t0) R = unknown; (t2 - t1) R = 0.66097 sec. (measured). t = ttotalR = (t2 - t1 ) R + (t1 - t0) R = 0.66097 + 0.1674 = 0.82857 seconds. Solving the equation: a = a R = 32.2619 feet/second2. a NR = 32.1549 ft/sec2 (normalized value); aR = 32.2619 ft/sec2 (from (f) above). Solving the equation: F = 7.254 lbs. or converted to ounces: 0.024 lbs. x 16 oz/lb = 0.38 ounces. (1) "The Effect of Gravity on Rotating Objects," Edward C. Delvers and Bruce E. DePalma, 18 March 1974, Simularity Institute reprint.